On Friday 2 June 2017, I successfully defended my thesis entitled “Between the lines: a study into the cognitive, neural and endocrine underpinnings of generating communicative behaviours”. The studies in this dissertation seem to indicate that the processes underlying the generation of well-adjusted communicative behaviours, that initially seem social in nature, cannot be distinguished from general-purpose processes used for solving complex problems. De Boer, M. (2017). 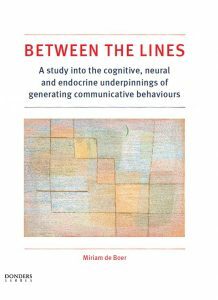 Between the lines: A study into the cognitive, neural and endocrine underpinnings of generating communicative behaviours. Nijmegen, the Netherlands, Donders Series 273. These videos provide representative examples of communicative behaviours recorded during the task reported in Chapter 4 and Chapter 5 of the thesis (Tacit Communication Game). Each video contains an example of the different types of communicative signals spontaneously generated by participants during the game. To facilitate visibility, one second has been added before and after each transition across trial events (Events 1 to 5) and a slow-motion repetition of the Communicator’s movement has been added at the end of Event 2 (adapted from Stolk et al., 2014; Stolk, Verhagen, et al., 2013). De Boer, M., Kokal, I., Blokpoel, M., Liu, R., Stolk, A., Roelofs, K., van Rooij, I., & Toni, I. (2017). Oxytocin modulates human communication by enhancing cognitive exploration. Psychoneuroendocrinology, 86, 64-72.
sensorimotor computations. Scientific Reports, 7.
communication? Frontiers in human neuroscience, 7.
in the human brain. Psychological Science, 21(1), 8-14 (* shared first authorship). I participated in a program of the Radboud University’s Science Hub helping to bring our scientific work on human communication to the classroom. 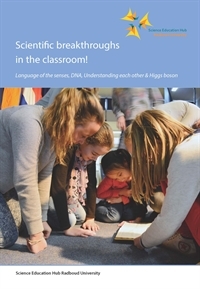 Activities included training and advising schools on how to implement the inquiry based learning program in the classroom, giving lab tours at the Donders Centre for Neuroimaging and writing of a book chapter containing scientific background and activities for primary school children and their teachers. The book chapter is available in English and in Dutch . TicTacTeam is a collaborative puzzle game for two players. I advised on the nature of the content of the app and wrote the app’s manual. If you would like to try out one of the games with which we study human communication, you can get it from the AppStore here.